Good posture enables you to express yourself. More beautiful and more powerful, when you stand tall you achieve the finest point of balance both mentally and physically. Postural abnormalities should be corrected early before they become permanent. Many of us still carry ourselves as we did when we were children. Girls taller than their classmates slouch to appear shorter. Boys, wanting to look strong and virile, puff out their chests. Compound those behaviors with today’s work environment. We sit in front of a monitor for extended periods of time, in positions that do not promote good spinal health and posture. Many people sit with forward head posture (look for the telltale dowagers neck hump) and rounded shoulders. Treatment for these muscle imbalances should begin as early as possible before they become permanent and create pain. Do we carry ourselves in such a way that all of our actions are easy and effortless, with grace and poise? Or do some actions feel clumsy or cause pain? The posture of man is unique in the entire animal world. The head, trunk and pelvis are stacked one above the other, ideally bringing the center of gravity from the floor and foot up to the hip joints. The pelvis is tilted neither forward nor back, and no unnecessary effort is required to keep the head tall or shoulders relaxed. 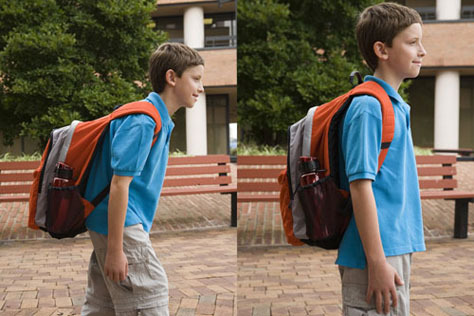 This efficient posture is easily attainable for both children and adults. The ultimate aim of good posture is to move the whole body together in harmony. After an analysis of your posture and gait, a session will be designed specifically for you to connect your skeletal elements into an effortless equilibrium. Without effort, your muscles and limbs will begin to assume the effective postural relationships you had as a child. My approach will helps the body remember how it feels to function efficiently, effortlessly, before the self-esteem issues of puberty, the long hours spent behind a computer, or that painful accident occurred. Visit Lori L. Malkoff, MD and experience how the effortlessness of effective posture will change your life! The duration of treatment and number of visits will vary depending on your particular issues.